It may seem like a broken record at this point, but the problem is that the scratches and skipping are getting worse – much worse. According to the latest reports, the camera industry has gone from decline to freefall, with 34.7% fewer camera systems shipping in February 2019 than February 2018. That's according to international industry body CIPA, the Camera & Imaging Products Association. 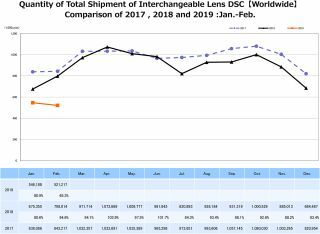 In its latest CIPA Report, publishing statistical data from February 2019, it found that shipments of interchangeable lens cameras was down to just 521,217 – over a quarter of a million fewer cameras than were shipped (798,014) in the same period last year. The "bigger" picture isn't much better. The total number of cameras shipped (including fixed lens systems) was 935,148, just 69.7% of the number shipped (1,340,995) in February 2018. Canon made headlines in January when its CEO, Fujio Mitarai, prognosticated that that camera market could shrink by 50% in just 2 years. The reason, he said, was that smartphones were cannibalizing sales. "People usually shoot with smartphones," said Mitarai. "The digital camera market will keep falling for about two years, but professional and [advanced] amateurs use about 5 to 6 million units. Finally [the market] will hit the bottom." Last month, Fujifilm's Toshihisa Iida's response was emphatic. "Totally, totally disagree," said the General Manager of Fujifilm's Optical Device and Electronic Imaging Products Division. "We really just cannot believe that projection of Canon's." Last month, however, the annual LensVid report noted that the camera market has collapsed 84% since 2010. Whether you feel that Canon is being too pessimistic, or Fujifilm is being too optimistic, these reports don't lie – and they paint a troubling picture. While the best camera phones keep getting better and better, the camera-buying public isn't reacting the same way to technological developments in the traditional camera world. If shipments have slumped by over a third despite Canon, Nikon, Sony and Olympus putting out new product, Mitarai might actually end up being an optimist with his prediction.